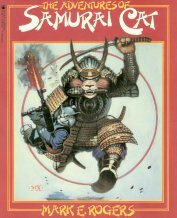 This unusual cat book tells the story of a cat Samurai and his kitten nephew who go out to revenge the murder of the Samurai's lord. The over sized paper back book is lavishly illustrated with black and white color illustrations throughout. Copyright 1984, approx. 300 pages. Not appropriate for small children. Previously owned but in good condition.